First-time skipper Simeon Tienpont on team AkzoNobel said after the series finish: "We knew already it’s close action but definitely learnt how important it is to have the routine on board right and keep everyone focused all the time." After months of training together in all conditions MAPFRE skipper Xabi Fernández is eager for his team to recuperate before attacking the final preparations. “One of the things we have to do now is have a good rest because it has been a lot of work over this last month,” he said. While it’s tempting to label MAPFRE as favourites going into the race, none of the skippers will be taking anything for granted. 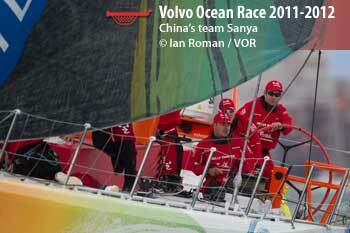 “I think Dongfeng is well prepared and they have been working hard all the winter as well," said MAPFRE's Xabi. Charles Caudrelier, whose Dongfeng team finished second overall and won the Volvo Ocean 65 class in the Fastnet, added: “I think I am happy. I think we had a good speed and a good spirit onboard. I’m pretty sure we can do very well." Designed to withstand the toughest conditions on Earth, the Volvo Penta D2-75 with Saildrive engines completed their first lap of the planet in the 2014-15 edition as an essential part of the One Design Volvo Ocean 65 boat. In the next edition, starting 22 October, Volvo Penta will provide hands-on technical expertise 24/7 to the race teams as the fleet prepares to race three times more Southern Ocean miles than in recent editions. Although the use of engines as a primary propulsion source is prohibited during racing, the D2-75 engine is a key part of life onboard – powering the boat’s total demand for electricity for computers, navigation equipment, lights and communications units. Additionally, the engine onboard provides power to the batteries to run the water maker, supplies power to the hydraulic system for the canting keel – which provides extra counterweight when racing – and is a potentially lifesaving instrument in case of an emergency situation. 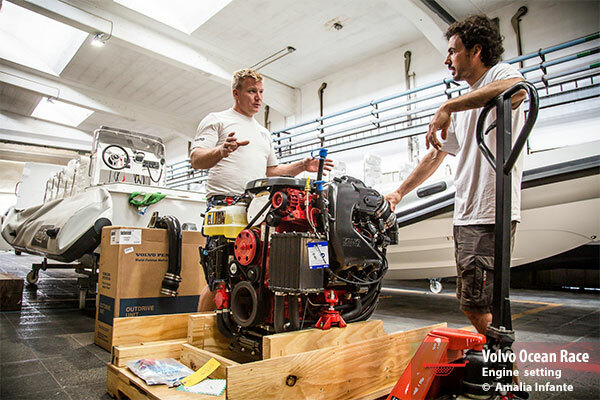 Volvo Penta engineer Johannes Karlsson – with 16 years experience as a marine engineer, and backed by Volvo Penta’s global dealer network – will deliver full-time support to the event, travelling to every Host City around the world to deliver world-class engine support through The Boatyard. The Boatyard is a unique shared service centre facility which ensures that all the Volvo Ocean 65s have access to the same level of maintenance and repairs after each leg of the race. Each of the seven Volvo Ocean 65s has recently undergone a comprehensive one million euro per boat refit process in Lisbon, Portugal – and an eighth, identical boat has been built by team AkzoNobel. Volvo Penta is also providing its next generation of gasoline sterndrive engines and complete prop-to-helm equipment for new RIBs that will be used by the sailing teams at each city where the race stops around the world. The V6 280 model has been provided, delivering the cleanest engines available on the market in the gasoline segment to the sailing teams. Additionally, Volvo Penta is delivering power generation for the newly designed Volvo Pavilion at each Host City around the world, providing prime power to support business operations, guest hospitality, and the high-tech environment inside. This same technology is used every day to deliver power to people and society around the world. The Volvo Ocean Race begins on 22 October 2017 in Alicante and will visit a further 11 Host Cities around the planet – visiting Lisbon, Cape Town, Melbourne, Hong Kong, Guangzhou, Auckland, Itajaí, Newport, Cardiff and Gothenburg, before a big finish in The Hague in summer 2018. The Volvo Ocean Race has solved the question of whether its future should be monohull or multihull – by opting for both. The introduction of a foil-assisted 60-foot (18.29 metre) monohull for the ocean legs plus an ultra-fast 32-50 foot (10-15m) flying catamaran for us€e inshore will elevate the race to the ultimate all-round test in professional sailing. The race announced the next generation of One Design boats – to be introduced in 2019 and designed for use over at least six years ­– as the centrepiece of its vision for the next decade which significantly raises the game in both sporting terms and commercial value. “We had a lot of debate about multihull versus monohull – strong arguments in both directions. We decided on three hulls – a monohull plus catamaran!” Volvo Ocean Race CEO Mark Turner revealed at a special event at the Volvo Museum in Gothenburg, home of the race’s co-owners Volvo Group and Volvo Car Group. “This new formula for the Volvo Ocean Race will, for the first time, test world-class sailors at the top-end of both aspects of the sport – in what remains our core DNA offshore ocean racing on foil-assisted monohulls, plus inshore racing during the stopovers employing the latest ‘flying’ multihull technology. To win the Volvo Ocean Race in the future will demand expertise in both monohull on the offshore ocean legs and multihull racing in the In Port Series, as both platforms will be raced by essentially the same crew. Currently the In-Port series counts only as a tiebreaker in the case of equal points at the final finish line – in 2014-15 it actually changed the overall positions for two teams, confirming that it was already critical to do well even as a tiebreaker. In the future, the In-Port series will take slightly more importance again, but without changing the fact that it’s the ocean legs that count for the lion’s share of the points. France’s in-demand Guillaume Verdier is designing the new monohull, which will use the very latest in foiling technology and is essentially a turbo charged IMOCA 60. The plan is that the design will include an option for the platform to be convertible, relatively quickly and inexpensively, to a short-handed rules-compliant IMOCA boat, able to compete in other major events on the IMOCA circuit such as the solo Vendée Globe and two-up Barcelona World Race. A tender process opened today for the design and build of catamarans (32-50 foot; 10-15 metre) which will be built to a strict One Design rule like the monohulls, permitting much of the very latest ‘flying’ technology to be built in, but at relatively low cost. “The America’s Cup, one of the other pinnacles of our sport, will always be at the absolute cutting edge development wise, with incredible technology leaps that we will see first-hand in Bermuda next week which are quite stunning,” said Turner. “We have seen the same technological advances in the IMOCA class with the introduction of foils in the recent Vendée Globe. Initial builds will be 8 of each mono and multihull, and will be made available to teams on a lease basis, thereby removing the asset purchase barrier that often prevents teams start-up, with sponsors involved in the upcoming 2017-18 edition getting first option. The first of the new boats will be completed by January 2019, with the whole fleet ready by the middle of that year. Persico Marine in Bergamo, Italy will lead the construction of the new monohull and the race’s own team of boat builders and experts at The Boatyard will complete the final fit-out, at a location to be confirmed as part of the Host City Tender process. While it will be strictly One Design, there will be a lot to play with and learn on these new machines – plenty of scope for ‘tinkerability’ by the teams in terms of the way the boat is set up to race. Possible evolutions in between editions will be built in as far as possible to the concept from the start. “The new boats will be delivered on a lease basis, and along with the growing package of benefits provided centrally by the race, we expect budgets to be at a similar level today,” explained Race CEO Mark Turner. Those team budgets are at an average of 10-12m euros spread over two years, including several million normally attributable to activation costs. “The provision of central services and equipment allows the sailors to concentrate on winning the race on the water, rather than duplicating costs across the campaigns,” Turner continued. Verdier, who is currently finalising plans for the next generation boat alongside his team of designers, said: “I’m extremely excited to be trusted with the task of delivering the next generation of Volvo Ocean Race boat. Volvo Ocean Race sailors have a reputation as relentless athletes who push extremely hard and the future boat design reflects that. “For that reason, it’s important to retain a certain level of safety in the design, which is especially key due to the places the fleet races through, such as the Southern Ocean. “Given their reputation, we know that Volvo Ocean Race sailors are unlikely to retract the foils, and where many single-handed sailors might slow down, they won’t. Crew numbers will be between 5 and 7, plus the OnBoard Reporter, and rules will continue to include incentives for mixed male-female crews and youth sailors. Speaking about the key decision on boat design, Turner also said that in the longer term, the race could even go fully multihull. “Following our detailed discussions this time around, there is no longer any kind of conceptual barrier to the Volvo Ocean Race going multihull offshore in six years’ time, a decision to make just 3 to 4 years from now. We came very close to going that route this time. “In the next decade, it’s very possible that we’ll see multihulls from the new French Ultime class racing across the oceans, most of the time flying above the water, rather than on it – a significantly greater challenge than doing so inshore in flatter water. The Volvo Ocean Race will embed a comprehensive Leadership Development and Team Performance Programme in future editions, based on the hard-earned experience of the pro sailors and including a ‘Global Team Challenge’ race to provide the ultimate team development opportunity for stakeholders. Sponsors have often asked skippers and crew to provide insights into the way they handle high-stress issues of leadership and teamwork during the Volvo Ocean Race. In response to the clear demand, the race will formalise these learnings and make them available to businesses with on-land and on-water elements. Launching in the edition after 2017-18, the Global Team Challenge will form the centerpiece of the on-water part of this HR focused programme. This will also act as a new entry point for future sponsors of teams in the race. This race will provide the ultimate challenge for amateur sailors, including those with no prior experience, giving employees a unique experience of offshore and ocean racing, under the highest standards of training and management, but nonetheless in conditions close to those faced by the professionals. There will be a significant pre-race programme of individual days to complement the on-land training, as well as pre-race training for crews. It will then shadow part of the Volvo Ocean Race route, and sponsors will be able to switch out their crew at every stopover to give more people an experience – and a challenge – of a lifetime. Race CEO Mark Turner highlighted the added value the programme will provide to team and race sponsors in different areas. “The Leadership Development and Team Performance Programme is all about creating new business value for our stakeholders,” said Turner. Richard Mason, who competed in the race four times before going on to coach Team SCA in the last edition and then join the race organisation as Executive Director, said smart busnesses would get a lot out of the programme. “The Volvo Ocean Race drives human relationships from beginning to end,” explained Mason. “You get to know your crew better than your own family, you see them scared for their lives at times. You see your team at their absolute best and absolute worst. “You’ll see that people have skills that will help you win but you need to know how to bring out the best in them, and it’s not always obvious. The Global Team Challenge will be contested in the current fleet of Volvo Ocean 65s, detuned sufficiently to make it possible for non-professional sailors to handle them. 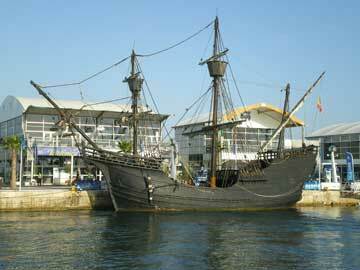 Each yacht will have 8 amateurs onboard, trained and led by 3 experienced professional sailors. Safety will be of paramount importance, not only with the 3-8 ratio of professionals to amateurs, but also in an extensive pre-challenge training period. “There are so many parallels between running a business and entering a team in the Volvo Ocean Race,” said Race Director Phil Lawrence. Volvo Ocean Race sailor Dee Caffari highlighted her own experience of being in demand by businesses to give insight based on her experience on Team SCA in the last edition. The Volvo Ocean Race has launched a major Sustainability Programme for the 2017-18 edition and beyond – signing partnerships with 11th Hour Racing, AkzoNobel and United Nations Environment, while outlining a series of commitments that focus on ocean health. The race is putting sustainability at its heart and focusing on taking action to help ‘Turn the Tide on Plastic’ – the rapidly growing and critical problem of plastic polluting the ocean, highlighted by the United Nations Environment’s Clean Seas campaign that is being adopted by the Volvo Ocean Race. There are three key pillars to the Volvo Ocean Race sustainability strategy: To minimise the race’s own footprint with a particular focus on reducing and where possible eliminating the use of single-use plastic by the teams, and in the Race Villages – a challenging task but one that will help to change behaviour by making it a focus. To maximise the race’s impact using its global communications platform to spread awareness, an educational programme to change views, and a science programme, using the Volvo Ocean 65 racing yachts to capture data while at sea and contribute to our understanding of the oceans in the most remote areas of the planet. To leave a positive legacy wherever it goes, through many actions but in particular the creation of Ocean Summits to bring together science, government, sport and business, with an objective of getting attending parties to commit to new positive actions in this area. The three partnerships, announced in Gothenburg on Thursday during a major presentation on the race’s future, provide significant amplification of the race’s efforts. 11th Hour Racing will be the founding Principal Partner of the Sustainability Programme. The partnership will allow the Volvo Ocean Race to work together with 11th Hour Racing on a wide spectrum of goals, from pioneering new approaches to tackling ocean plastic pollution issues, to providing a model of sustainable practices for the world of sports and event management; promoting change among sports fan as well as on a governmental level to foster long term planning around sustainability, particularly in relation to plastic consumption, waste and ocean health; and inspiring future generations. This partnership will raise awareness on Ocean Health issues and promote solutions to the specific problem of plastic pollution. 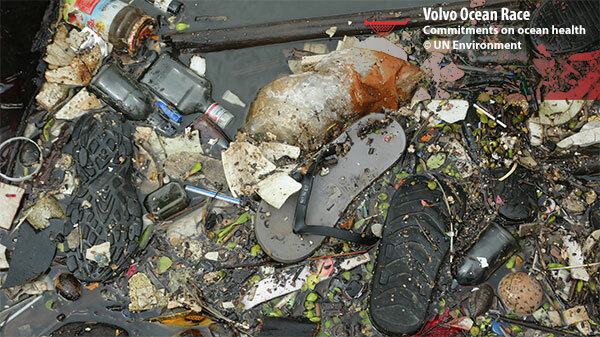 Volvo Ocean Race is committed to scaling up its activities right across the sustainability space. The partnership will include the organisation of a series of Ocean Summits to build on the impact created in the last edition in 2014-15, and the production of educational content in the Race Villages at every Host City. The Summits will foster a space for dialogue, change and action among key stakeholders within governments, companies, education and scientific communities. “11th Hour Racing and the Volvo Ocean Race are natural partners,” said Jeremy Pochman, Strategic Director and Co-Founder of 11th Hour Racing, a programme of The Schmidt Family Foundation which aims to increase our understanding of the oceans, find innovative solutions to the challenges that impact marine resources, and promote stewardship of the seas through strategic partnerships within the sailing and marine communities. The race has signed a partnership with AkzoNobel to amplify its Sustainability programme. The partnership – will focus in particular on educating people about reducing plastic use and protecting our oceans – will pro-actively build on the long-established commitment to sustainability of both parties. “Our involvement with the Volvo Ocean Race and the participation of team AkzoNobel are a perfect fit with our Planet Possible sustainability strategy,” explained André Veneman, AkzoNobel’s Corporate Director of Sustainability. 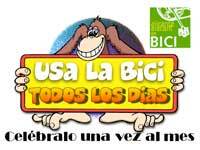 The race will also collaborate with the United Nations to help support its ‘Clean Seas’ campaign. The partnership with UN Environment will see the Volvo Ocean Race use its storytelling platform to amplify the Clean Seas campaign to ‘Turn the Tide on Plastics’ in the ocean, tackling the growing problem of marine litter. Together, Volvo Ocean Race and UN Environment will draw attention to what is at stake – with one study predicting that there will be more plastic than fish in the oceans by 2050 * if we do not act. Each of the Volvo Ocean 65s will carry the Clean Seas message on the boom and the race will amplify the campaign in all 12 Host Cities and across the globe, seeking strong commitments to combat marine litter from countries, cities and individuals alike. Volvo Ocean Race CEO Mark Turner explained the three pillars of the Volvo Ocean Race strategy. “Firstly, we have to minimise our own impact and that’s true right across all of our operations. Specifically, we are trying to reduce, or eliminate where we can, single use plastics in our Race Villages and our own operations because that problem in its own right is a major one for the health of our oceans. “Secondly, we are using our global communications platform to change other people’s views and other people’s behaviour in this respect. “And, thirdly, our goal is to leave a legacy. We go to 12 Host Cities and in each location we are able to impact, influence, change views, and get new commitments while we are there from governments and business. 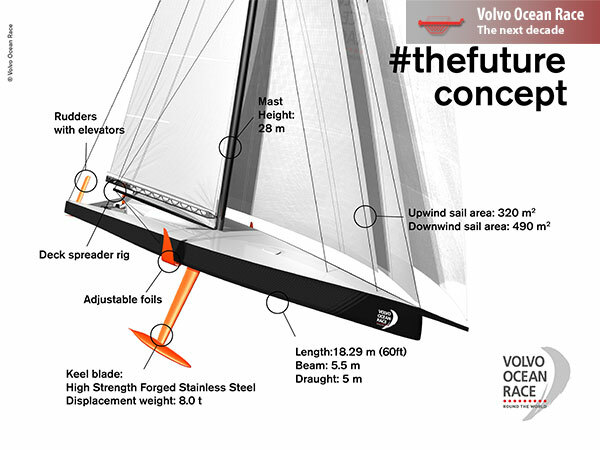 Looking further ahead, the Volvo Ocean Race will use the One Design race boat platform to do everything possible to reduce and then eliminate fossil fuels on board the boats in the future. The use of a hydro-generator for the first time during the 2017-18 edition should be a significant first step in reducing the use of fossil fuels, with race management able to mandate the use of the hydro-generators by each team. The long-term vision will be to eliminate the use of fossil fuels on future boats, while maintaining the minimum energy onboard for safety and communications. The commitment to One Design for the new 60-foot foiling monohull unveiled at the Gothenburg announcement provides the best platform to make this happen in the fastest possible time. One Design means some small compromises on performance can be made to help deliver better solutions in other areas – for example a small weight gain in a One Design fleet, impossible when teams are doing their own designs, can be imposed to allow a heavier but healthier energy source. 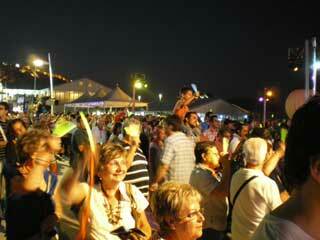 Light, sound, hundreds of performers and the best sailing crews on the planet all came together to inaugurate the Race Village. 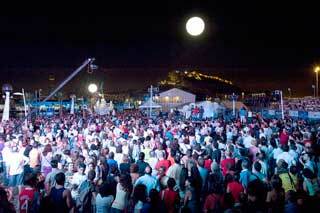 The gates opened to the public at 19:30 and the crowd poured in as the sun set over the purpose-built Race Village ringed around the inner harbour of Alicante. 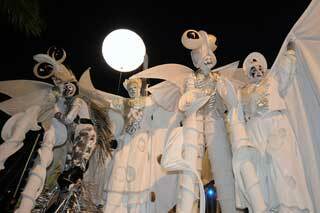 The public was given time to walk around the Village, to test the attractions, and soak up the atmosphere. 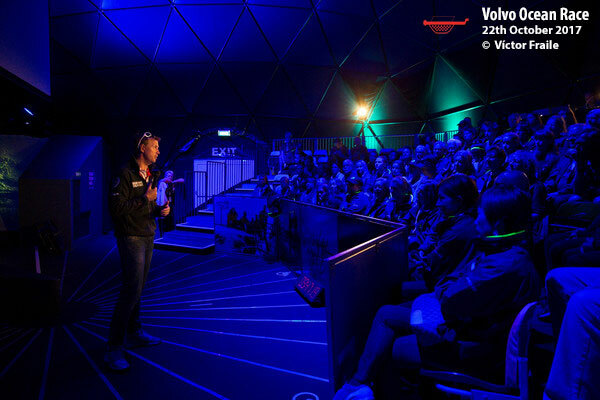 Among the highlight destinations was the interactive Volvo Ocean Race Experience, comprising of the Ride, the Dome, the Pool and the Grinding Challenge. The Ride is a simulator that gives users the sensation of what it is like to be at sea on a Volvo Open 70 in extreme conditions. The Dome is a cinematic representation of life on board during the race, whilst the Pool allows participants to show their tactical skills on scale model Volvo Ocean Race boats during an ‘in-port’ race. The Grinding Challenge is a test of strength, showing just how physically demanding the boats can be. 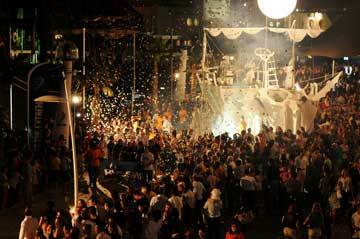 Then, the volume was turned up as crews for the eight competing teams were paraded into the harbour aboard their race yachts to the pulsing beat of their team theme songs before each squad was ushered on stage in turn, escorted to the platform by dozens of performers. The evening concluded with a bang; several bangs in fact. 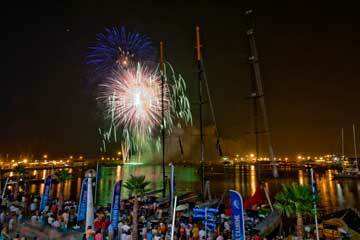 Over 1,000 kg of fireworks were detonated to put an emphatic stamp on the opening ceremony. 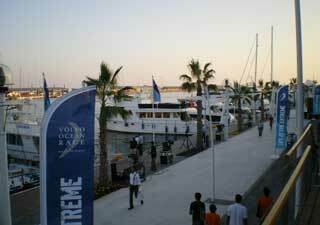 The Volvo Ocean Race village will remain open to the public seven days a week through to the start of the first leg to Cape Town, on October 11th. Gates open daily at 10:00 each day and close at midnight. On concert nights the opening will be extended until 02:00.